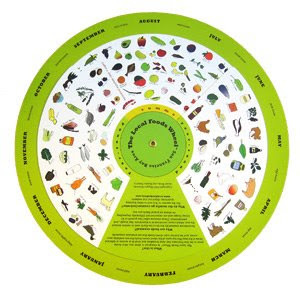 The Local Foods Wheel is a cool dial-shaped gizmo for remembering what local foods are in season. It comes in two versions, for San Francisco and New York City, and more locations are in the works. What is the Local Foods Wheel? The local foods wheels for the San Francisco Bay and New York Metro Areas are designed to help you identify what foods are grown in those regions, and what is in season at various times of the year. The wheels are 12 inches in diameter printed on card stock in bright, full color. The top wheel shows the foods that are available year-round, and the bottom shows foods that are available only seasonally. The top wheel exposes one season of the bottom wheel at a time, so that you can see what foods are available during that season. The authors include Jessica Prentice (chef and author), Sarah Klein (artist), and Maggie Gosselin (a Friedman School graduate student and also the designer of the new title banner and template for this blog -- thanks a bunch! ).